The Derope emergency escape/controlled descent device enables the evacuation of one or two persons from an elevated position to a lower level or the ground at a controlled speed. The Derope descent device can also be used for one man or two-man rescue operations. 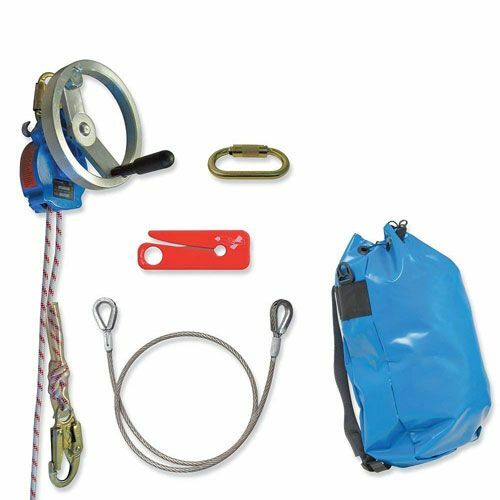 Victims can be lowered alone or accompanied by the rescuer following the standard procedures for rescue applications. If obstructions or obstacles prevent a vertical evacuation, the operation can be carried out down a cableway or tagline positioned at an angle between 30º and 60º. Model incorporates a hand wheel winch mounted on to the base unit which allows the Derope descent device to be used as a lifting device. With a lift ratio of roughly 2:1, the winch is capable of lifting a victim in order to release it from its fall protection sub-system. * The video on this page is for general information only, and should not be considered an exact representation of the product being offered. For example, this kit does not ship with a hard plastic carrying case.